We’ve still got a few months left in 2018, but my site Printable2019calendars.com is already up and running with 2019 calendars. I know a lot of you like to plan in advance, so all of calendar designs are ready to download and print for free. This is my 10th yearly calendar site! Printable2019calendars.com has calendars for each month of the year, the entire year at once in 12 pages, year-on-one page designs, and more. You’ll find year-on-one-page calendar variations with holidays in red, shaded weekends or with the weeks starting on Monday. There are both vertical and horizontal calendars as well as versions with two, three, or four months per page. 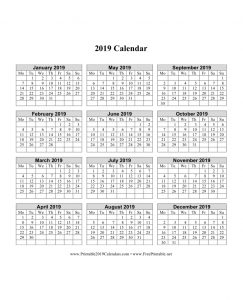 Printable2019calendars.com also has: a large-type calendar, wallet-size calendars, and monthly calendars with “mini months” at the bottom of each page. You can downloaded any calendar free as a PDF or, in most cases, a DOC version that you can type into using Microsoft Word. For 2018 calendars 2018 calendars visit Printable2018calendars.com. To print a free calendar for any month from the years 1800 through 2099, head to RocketCalendar.com. You’ll find planner refills at PrintablePlanners.net.